I tried Linda’s flourless chocolate cake yesterday for Hanukkah, but it fell apart when I tipped it out of the pan. After the swearing stopped, I thought, how can I use broken, crumbled cake? Ah! Trifle! So how can I make a WLS friendly trifle? I bought a can of sour cherries packed in water (no sugar added) and a large container of Fage Total greek yogurt 0% fat. 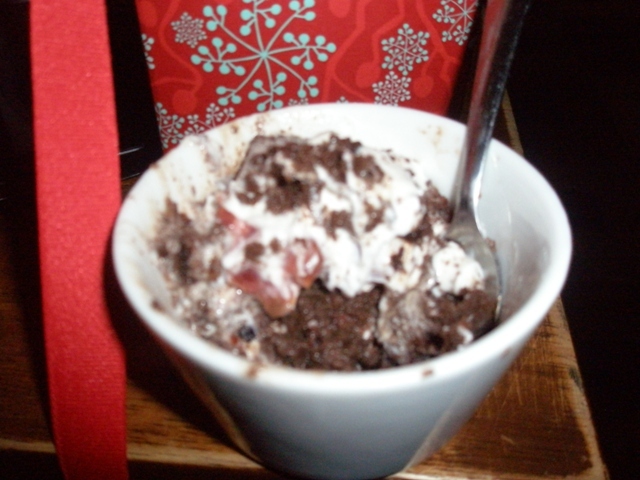 I mixed the cherries and juice with some splenda granular and poured over the crumbled cake to moisten it. Then I mixed splenda with the yogurt and spooned that in over the top. I had JUST enough canned whipped cream (NSA) in the fridge to make a pretty circle around the edge. The result was stunning! First, no one believed I used black beans in the cake. It was too die for! And then the yogurt tasted just like custard/pudding and everyone just loved it. It was almost gone before I thought to take a picture – here’s what’s left of my serving! Oh and if you want to try it, I did it with the brown sugar splenda blend that is half brown sugar and half splenda. Might be why it crumbled….but it tasted great! Oh, no!! I’ve had that happen, too…and it’s frustrating beyond belief!! But the trifle is a fab idea and I’m so glad you loved the cake – broken or not! I see the makings of a Karen Brier cookbook!